Big Sky Montana Beautifully decorated condo in the mountain village. This beautifully appointed studio is located just walking distance to the base ski area of Big Sky Resort. It is located nearby the free shuttle service and free skiers parking area. This condo has been recently updated with beautifully appointed fly fishing and ski décor to create an outdoorsman rustic Montana experience. An open floor plan with a full sized kitchen and table to fit up to 4 people, plenty of living room seating and beds to sleep comfortably. Very clean and spacious accommodations with a peaceful setting, a babbling creek runs right below the window that can be heard during the summer time. Enjoy complete serenity and peacefulness or star gazing after a day outdoors, enjoying all that Big Sky has to offer. One may see a moose or 2 that like to frequent often right outside the living room window or a bear and other wildlife passing by. This is the perfect retreat and accommodations for all to enjoy. * 24/7 Professional Property Management. * Concierge Service is Available. OUTDOOR ENTHUSIAST: This beautifully appointed modern rustic condo is the PERFECT location for your Yellowstone Park and mountain adventures. 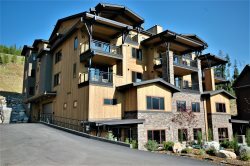 LOCATED: in a prime location walking distance to Big Sky Resort skiing and mountain activities. Moonlight Basin is about a 2-3 min drive to the base of the ski lift area. This beautifully appointed condo is the perfect Montana getaway. Close to cross country skiing, dining, shopping, cinema, groceries, medical, you name it, you are all within very short driving distance. WINTER activities: This condo is less than 2 minutes away to some of the biggest and best skiing in America. Over 5800 acres of ski terrain between Big Sky Resort and Moonlight Basin: 24 lifts and 220+ trails. You will enjoy the lack of lift lines (in comparison to other ski areas) and the amazing terrain. Snowmobiling in West Yellowstone and the wildlife adventure is 45 minutes away. SUMMER activities: This condo is walking distance to hiking and biking trails. Nearby to famous Gallatin River fly fishing, whitewater rafting, horseback riding, and golf. KITCHEN: The chef in the family will appreciate the fully equipped kitchen with a full-size range. Whether visiting in the summer for Yellowstone or the winter to ski, this condo is exactly what you dream about when you picture the perfect vacation with stunning views! For the convenience of your party, we recommend having a vehicle on hand for visiting all of what Big Sky has to offer. Free local shuttle service is available nearby. * Master Suite (Main Level): Queen sized bed with plush comforter, full bathroom, and a large shower. * Bunk Bed with a full-size bottom bunk and twin top bunk. * 42” flat screen TV. * Vanity: full-size area with plenty of space to get ready. This condo has all the features for the cooking enthusiast. This kitchen has every convenience needed and is fully equipped. Right off the kitchen is a beautiful dining room with seating for four people. * Free Shuttle Service to/from the steps of Big Sky Resort.